Professional cyclist Tom Danielson used to have a bad back. He shifted in the saddle, never comfortable, often in pain. When doing crunches made matters worse, he turned to personal trainer Allison Westfahl for a new approach. Danielson and Westfahl developed all-new exercises to build core strength specifically for cycling, curing Danielson's back problems and giving him a new performance edge. 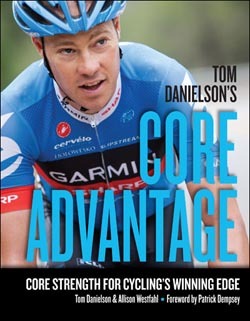 Their new book Tom Danielson's Core Advantage: Core Strength for Cycling's Winning Edge will help cyclists of all abilities to ride stronger, longer, and more comfortably. The book will is now available in bookstores, bike shops, and online. Preview the book at www.velopress.com/tommyd. Tom Danielson's Core Advantage delivers 50 essential core exercises for cyclists of all levels, amateur to pro. Each Core Advantage exercise complements the motions of riding a bike so cyclists boost efficiency and eliminate pain in the back, neck, and shoulders-all without weights, machines, or a gym membership. The book's simple exercises build strength in the low back, hips, abs, chest, and shoulders without adding unwanted bulk. Diagrams explain the goal of each exercise, which Danielson models in clear photographs. Beginner, intermediate, and advanced core training plans will strengthen muscles that stabilize the body so cyclists can pedal more efficiently, maintain power out of the saddle, and climb with newfound power. Each plan will create balanced muscle strength that helps cyclists avoid overuse injuries and develop endurance to prevent tightness and painful knots and strains. Tom Danielson is a professional cyclist with Team Garmin-Sharp-Barracuda. Danielson won the national collegiate mountain biking championship riding for Fort Lewis College. He began his pro road cycling career riding for Team Mercury and then Team Saturn. Danielson won the Tour de Langkawi, Nature Valley Grand Prix, the Cascade Cycling Classic, Tour de Toona, and the Mt. Washington Hill Climb. In 2004, Danielson signed on with the Italian squad Fassa Bortolo and then Discovery in 2005 when he won the Tour de Georgia. While riding for Discovery, Danielson won a stage of the Vuelta a España. Since 2007, Danielson has consistently placed in the top 10 in stage races and Grand Tours, including stage wins in the 2011 Tour de France and USA Pro Cycling Challenge. Allison Westfahl is a certified coach, personal trainer, and founder of The Athletic Edge, a fitness consulting company based in Boulder, Colorado. She holds an MS in Exercise Science, a coaching certification from USA Triathlon, and has earned a CPT and PES from the National Academy of Sports Medicine. Westfahl has worked as a personal trainer to amateur and youth athletes as well as elite cyclists Ryder Hesjedal, Timmy Duggan, Blake Caldwell, and Mike Friedman. She is the author of The Gluten Free Fat Loss Plan. VeloPress publishes books on cycling, triathlon, and running to help both newcomers and committed athletes to build fitness and achieve their goals. For more information, please visit www.velopress.com.